Amid the swaying palms and warm sun of San Diego, a timeshare at the WorldMark Mission Valley resort brings you all the excitement of a Southern California vacation each and every year. 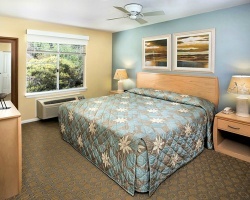 Find timeshare resales and rentals at the resort and save as much as 70% with SellMyTimeshareNow.com. Located in North San Diego, the WorldMark Mission Valley resort offers unbridled access to all of the city's best attractions. A full-fledged luxury vacation resort, the Mission Valley features a dazzling array of on-site amenities designed to provide the utmost comfort and the perfect convenience. 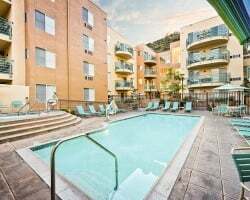 Take advantage of the free, secure underground parking to store your rental vehicle, or lounge by the outdoor pool and hot tub to take in that signature California atmosphere. With so much to offer in one convenient location, the WorldMark San Diego Mission Valley retains its status as one of the city's premier timeshare resorts. The resort includes upscale suites that overlook the city perfect for family trips or group getaways. Choose between a one-bedroom or two-bedroom timeshare unit to accommodate up to six guests, and enjoy a home-away-from-home filled with top-notch furnishings and SoCal decor. You'll find that your suite's premium bedding, fully-equipped kitchens, and private balcony offer exactly what you expect from your San Diego accommodations—effortless luxury and convenience. Are you ready to find your dream San Diego getaway? Fill out the form on this page to learn more about owning a timeshare at the WorldMark San Diego Mission Valley property, or call a representative at 1-877-815-4227. Owning a timeshare resale at the WorldMark Mission Valley can bring you years of guaranteed accommodations in San Diego, along with a variety of amazing owner benefits that will serve to enhance your travel experience each year. Resales at the resort are often priced much lower than what the resort itself values them at, giving you an opportunity to save thousands on the same great ownership solutions. You can save as much as 70% through buying resale, allowing you to spend more money on other vacation essentials, or leave it in the bank altogether. Resales at the Mission Valley WorldMark are typically available in the form of WorldMark by Wyndham points, which can enable you to make reservations each year at the Mission Valley resort whenever you choose. You can find a variety of ownership packages that contain different point values, allowing you to find a posting that suits your budget.Timeshares at the resort fall within WorldMark's Red season, and you'll be able to explore other vacation options using your flexible points. The Mission Valley San Diego resort is affiliated with WorldMark by Wyndham, a popular vacation ownership brand with locations across the globe. Your timeshare resale within WorldMark, The Club can open up opportunities to vastly enhance your vacation experience and unlock special owner benefits. While you won't be able to make reservations at Wyndham resorts using the CLUB PASS feature, you'll still be able to broaden your vacation horizons. Use your points to explore options at other WorldMark resorts from Canada to Fiji to diversify your yearly trips and discover new destinations. 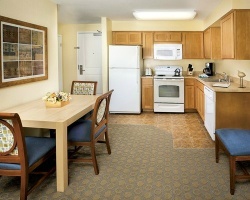 The WorldMark San Diego Mission Valley is also affiliated with the world's largest exchange network, RCI. 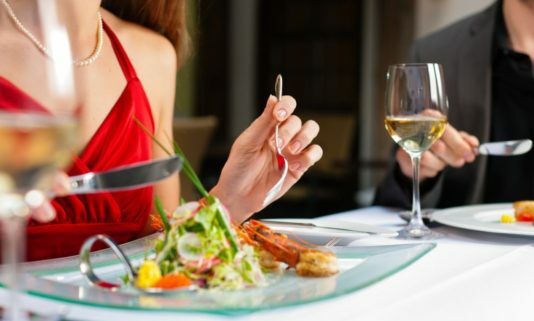 The affiliation gives timeshare resale owners at the resort the opportunity to completely change the way they plan vacations, just by using resale accommodations. Once you obtain your RCI membership, you can deposit your Mission Valley accommodations into the exchange network and trade for stays at comparable resorts across the globe, presenting nearly limitless vacation potential. The best part is, the WorldMark Mission Valley is a Silver Crown-rated resort, one of RCI's highest honors. The rating means you'll be able to trade with other Silver Crown timeshares, ensuring you aren't giving up luxury when you exchange. 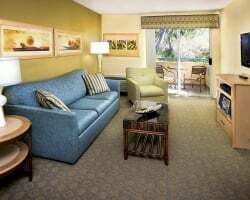 The Mission Valley WorldMark Resort San Diego is filled with luxurious amenities and services geared toward making your vacation one to remember each and every year. Find the resort's outdoor swimming pool and hot tub the perfect solution for enjoying the wonderful weather of San Diego, or opt to stay in peak physical form at the fitness center. Use the shared barbecue areas to cook meals and enjoy picnics on the resort grounds, or visit the arcade room and recreation center to challenge friends and family to rounds of pool and more. Just beyond the resort's boundaries, you'll find the best San Diego has to offer in an instant. Venture south to discover all the best spots around downtown San Diego, like the Gaslamp Quarter, the Embarcadero, and more. Catch a ball game at Petco Park, or opt to walk along the water's edge and stop in at the Maritime Museum of San Diego. Explore the massive Balboa to take the family to the San Diego Zoo, or find a more educational experience at the San Diego Air & Space Museum. Don't miss the delicious creations at the Donut Bar on B Street, and head to Little Italy for dinner to dine at some of the city's best establishments. Explore the area of La Jolla to find endless swimming, along with one of the best surfing spots in the United States. Already Own at WorldMark San Diego – Mission Valley?